For Annie Richards, music is not just a dream but her very life. It has propelled her to the very top as a star performer, sharing her songs and voice with millions every day. She is a woman fulfilled and fully alive. Then the dreams come. Strange nightmares of an unseen Presence and nameless fear. They’ve become constant, consuming. Something wants her–and her voice. THe first thing I noticed about Aerisian Refrain is that I could hardly put it down. The first thing I noticed about Aerisian Refrain is that I could hardly put it down. It’s been a while since I’ve come across a book I’ve enjoyed enough to completely suspend disbelief and intellectual analysis while reading it. The story (and its fictional universe) is riveting, enchanting, and richly detailed, with brilliant characterization. Some may find the narrative language a bit wordy, but it flows smoothly and even uses exposition in a way that genuinely enriches the story. The plot can basically be described as a “portal” fantasy taking a character from our world and placing them into a “magical” universe. The narrative opens with a picture of the main character’s life in our world before transporting her to Aerisia (the Land Beyond the Sunset). This is done in a way that creates steady buildup and even a pronounced element of psychological drama (Annie’s dreams play a prominent role in what is to come). This book is the first in its own series but actually continues a story begun in a previous one (see the Aerisia: Land Beyond the Sunset). Nevertheless, the protagonist’s perspective is skillfully used as a means of explaining the story world to new readers as well as ones with knowledge of the prior books. The imagined world of the book draws deeply upon several different mythologies, with the two primary ones in this particular story being Irish and Cherokee (in-story, many mythological creatures on Earth are based on real beings from Aerisia). The “metaphysics” of this imagined world are addressed similarly to those of George MacDonald’s classic novel Phantastes, and the imagery evokes comparisons at numerous points. The book is clearly intended for a general market audience, so it does not contain straightforward Christian allegory. I am not pointing this out as a bad thing. I definitely have a sense that this story was written “freely” and not weighed down by any heavy-handed “message” or wooden biblical parallels. One part that did give me some pause as a scene where one character advises the protagonist not to let “kin” or “religion” stand in the way of her love for a male romantic interest in Aerisia. This, however, just comes down to a somewhat unfortunate choice of words: the “religion” in question is an “honor code” similar to Bushido rather than a specific set of beliefs. The Story is driven by a variety of significant themes. With this being said, the story is driven by a variety of significant themes. A core one is music and the power it carries (in-story, it’s deeply intertwined with the book’s magical elements). Incidentally, this is a very biblical idea: the account of David driving away an evil spirit with his harp comes to mind. I also thought of classical and medieval concepts regarding the “Music of the Spheres” and the “Great Dance” of creation. Another significant theme driving the plot is that of determinism vs. free will: do our origins define us, or is it the choices we make? This ties in to another theme of “gifts” and how we use them, whether selfishly or sacrificially. Ultimately, this is the choice placed before the protagonist, with the outcome of the story hinging upon a moment of moral self-revelation. 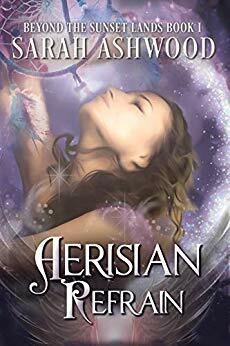 All in all, I would recommend Aerisian Refrain to fans of romantic fantasy and those who enjoy a fantastical premise and plot that immediately latches onto your imagination. Heat: There is a significant amount of romantic tension, and one scene where two unmarried characters come quite close to giving into their passions (but do not). There is also a “fade to black” scene involving a married couple. Violence: Some action-oriented violence and frightening moments. Age recommendation: 15 and up. Cost today: $3.99 on Kindle, $14.00 in paperback.